Pigment is an extremely special little pig. He came to us in 2013 in very bad shape, but soon turned into a gorgeous little pig with a one-of-a-kind personality.He is so unique that we started calling him an Arctic Schmink. a rare and endangered species. So rare that he is in fact the only one in existence. Not to be confused with the Common Schmink, Pigment's characteristics are short legs and barrel shaped body ( we say he is built like a propane tank with short legs) a black and white spotted coat, and a spotted nose. When he walks you can't see his legs and he appears to roll along on wheels, or creep like a caterpillar. 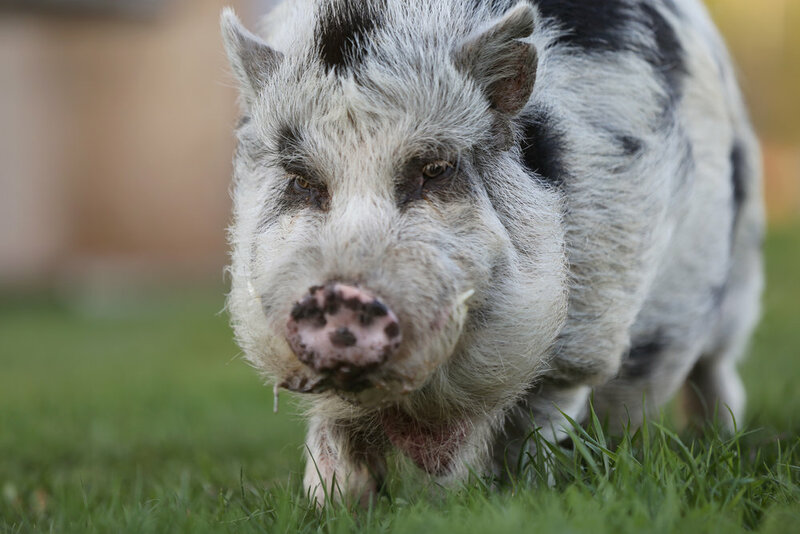 He is top pig here at the ranch, and rules his herd with a gentle hoof. He has a great propensity for language, and speaks many different dialects fluently. And often, A very rare pig indeed.